Peter Symonds College has a large dedicated Careers Department, which has held the Investor in Careers quality award since 2008. We are affiliated members of the CDI professional body, demonstrating commitment to providing impartial advice, guidance and progression of all students onto positive destinations once they complete their studies. 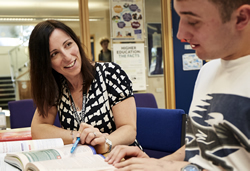 A Careers Programme is available for you to see in detail the support and activities we provide to all students, ensuring students’ progress onto positive destinations once they have completed their studies. We encourage students to actively participate in shaping and developing our service, recruiting careers reps and holding focus group meetings. We are also keen to seek feedback and views from parents, employers and organisations.